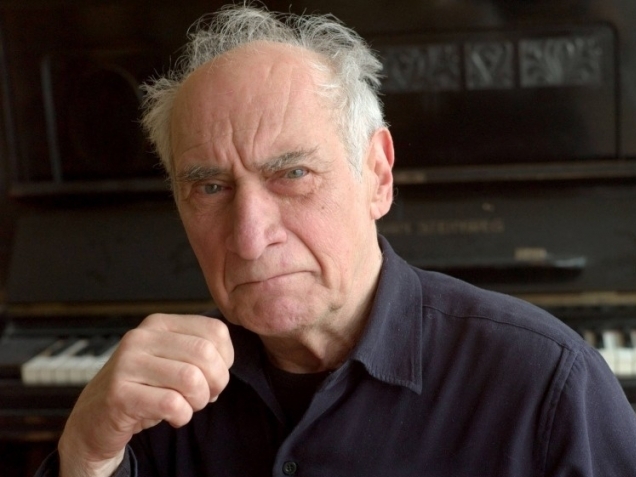 As Frederic Rzewski – who reached the age of 80 last Friday – suggests in the note below on his String Quartet of 1955, he has been many things in his life so far, including a pianist who gave the first performance of Karlheinz Stockhausen’s immensely demanding Klavierstück X when he was twenty-four, a founding member in Rome, four years later, of one of the first live electronic ensembles, Musica Elettronica Viva, a promoter of music he feels to have been overlooked, whether the composer be Tom Johnson or Felix Mendelssohn, and an artist whose work has been consistently informed by a humane political radicalism, not as an add-on but as inherent in whatever he might be doing: composing, performing, improvising. Almost his entire output as a composer is available in pdf form at IMSLP. The People United Will Never Be Defeated! (1975), a set of 36 variations on a Chilean song of the Allende era and a classic of the piano literature, has been recorded by more than a dozen musicians, including Ursula Oppens, Yuji Takahashi, Marc-André Hamelin, and Igor Levit, as well as the composer himself. Both the notes that follow were written by the composer in anticipation of the first performance, which, in the case of the 1955 piece, took place at the Library of Congress a year and a half ago. Words is receiving its premiere tonight. Thanks to David Plylar, who runs the music program at the Library of Congress, this fossil of my youth has come alive again, like some creature from Jurassic Park. He has asked me to write something about it. To be quite sincere, it was so long ago (60 years!) that I can hardly remember what went through my mind as I wrote it. I have never heard it. I do not play a stringed instrument. I have barely looked at it since it became clear that it would never be played. It is only by pure chance that it has survived at all; many other pieces have been lost in the process of moving from place to place, or have simply disappeared for one reason or another. I do remember that at that time I fell immediately and desperately in love with every woman who crossed my path. So I can only assume that this music must have something to do with love, especially the unhappy sort. I also know that I listened constantly to recordings of various kinds – Beethoven, Ravel, Bartók, Schönberg, etc. – and that this must have shown up somewhere in this piece, although as I look it over I can't immediately identify what is stolen from which composer. It looks like the work of a talented student, with all of the strong and weak elements typical of such students. There is undoubtedly some originality in the general conception; but at the same time there is clearly a lot of fakery as well. It is easy to spot places where the composer is pretending, simply borrowing clichés he has seen in this or that score by this or that composer, but doesn't really know anything about: all these ridiculous glissandi, for example, or the places marked "sul ponticello," etc., when it is obvious he knows nothing about string technique. If I were his teacher I would tell him to strike this stuff out immediately. But it is too late for that…. One thing I have learned from several decades of teaching is that, although it is possible to recognize talent immediately, it is impossible to predict whether that talent will go anywhere. Almost all children, for example, are great painters at age five. Great musicians, great poets, dancers, circus performers. Then, for one reason or another (usually already in first grade), they gradually peel off to become bankers, soldiers, garbage collectors, gangsters…. Similarly with composition students. Some of them (not necessarily the most interesting) go on to do something with themselves, with that dogged stubbornness that refuses to be told what to do or what not to do, which seems to be the main thing one needs if one wants (God knows why) to be a composer; others (who may in fact be the most talented, we will never know) simply decide they are no good (which is what capitalist society tells everyone in general), give up, turn to drugs or alcohol, or destroy themselves in one way or another. This is not a conscious choice, and it is quite impossible to tell which way the student will go. In this particular case, the student in question seems to have done a little of all of these things. How it will all end is still an open question. The difference between spoken or written language and music is like that between life and death, body and soul, or sacred and secular. They are absolute opposites. Yet they have something in common: in language, words; in music, notes. Here is a string quartet in which suddenly, for no reason at all, words are spoken; whether by one individual or by all four does not matter. It really is just a gimmick. It does not happen in most string quartets; but there are precedents, the best known of which, perhaps, is the last movement of Beethoven’s F major quartet, Opus 135 (although the words “Muss es sein? Es muss sein!” are normally not spoken). And I was deeply moved by Elliott Carter’s Fifth Quartet, which is like a spontaneous conversation, although no speaking is involved. The words in this case don’t mean anything. They are just words. They simply happened to be going through my head while I was writing the music. The Russian word okazalsya says it: it just turned out that way. They could also not be there. Or they could be different words. It doesn’t matter. I just liked the idea of a talking string quartet. Why not? Nor am I sure what they are, where they come from. “When the mighty are fallen, then are fallen many.” This is clearly a reference to the Biblical text: “How are the mighty fallen, and the weapons of war perished!” (II Samuel 1:27). But where does it come from? I think it might be Brecht, but I am not sure. “Down with the poor! Down with the rich! Down with the class struggle!” is from Julian Beck’s Theandric. In the second movement is a quote from Gorky’s reminiscence of Lenin speaking about Beethoven: “Astonishing, inhuman music! You want to pat people’s heads, when instead you should be beating them. Hm! Hm! What a devilishly difficult job!” The third movement is a homage to the Italian composer Giuseppe Chiari. I played his Gesti sul piano in a concert of his music in Florence, not long before he died. He then did a final piece. He said: “Una nota molto triste,” and played a note on the piano. Then he said: “Un’altra nota, ancora più triste,” and played another note. Finally, in the last movement, there is some meaningless babble, followed by an allusion to the old peasant’s words in Chekhov’s story “In the Ravine”: “Who knows? You can’t know everything. Only what you need to know in order to survive, that is all you can know.” Then the piece ends with the sound of a cow mooing. About the music little needs to be said. In 2016 David Plylar decided to program the string quartet I wrote in 1955, which had never been played, and asked the Del Sol Quartet to do it. He himself made a computer version of score and parts. The Del Sol not only did an excellent job, but asked me to write another one (more than 60 years later). This one is co-commissioned by Del Sol and Miller Theatre at Columbia University in New York. I have done other things for string quartet, notably The Triumph of Death, based on the Peter Weiss play The Investigation, a piece of music theatre with singers and actors about two hours long. But it’s refreshing to deal with this noble form again, especially now that a new generation of excellent string players has appeared who are ready to experiment, while carrying on with the classical tradition. It makes one want to live longer….